We promise you can write your ENTIRE funnel’s copy in 20 minutes or less using ScriptDoll. And now we are adding a powerful new script that will kick off your funnel right – the 10 Facebook Ads Script. This isn’t just a script… this is an ROI machine. 10 Different Sets of Ad Copy which rocks because you can figure out what your audience likes most! Audience Targeting Guidelines based on your profile to slash your ad creation time. Hand-Picked Images by the ScriptDoll team that are perfect for Facebook Ads so you don’t have to go hunting the web for them wondering if the image is any good. And of course they are all commercially free to use without attribution. Our Recommended Split Test Plan that we use here at ScriptDoll so that you know exactly how and when to execute your ads! Follow these directions to figure out the ads that convert best for you! Recommendations for Your Budget, no matter how big or small so you can get started immediately. Insider Secrets from our AdLab team to set you up for success from the beginning. [00:00:00] Hey, guys. 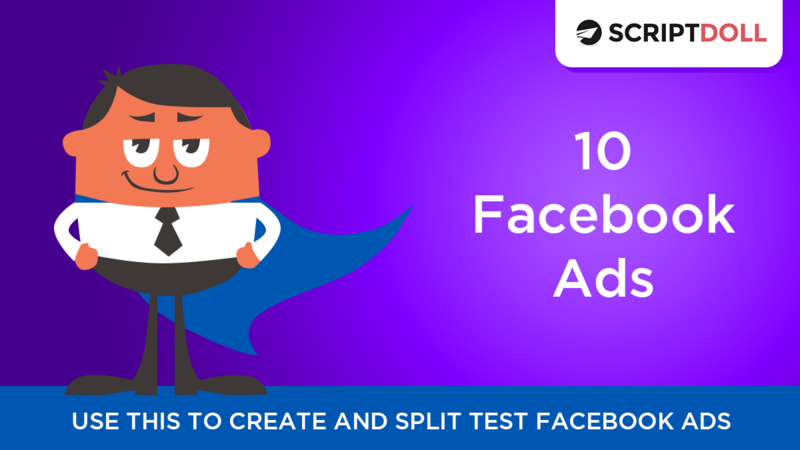 Monica here with ScriptDoll, and I am so excited to bring you the 10 Facebook Ads script. The reason is that we went a little further with this script and gave you some instructions on how to use it to split test your Facebook ads so that you could really get a huge ROI. Our goal with this is to make sure that you understand how to use Facebook ads to your advantage, and the biggest way that that works is to split test. [00:00:30] We have the split testing recommendations that we use at ScriptDoll right here. We’ve used several of these ads at ScriptDoll. Actually, we’ve used all of them. We have these other tips for success, things that you’ll want to do to make sure that you are running the ads the right way. Then, we break down the three parts of a Facebook ad. We’ve got your audience targeting, and I’m using the puppy training profile that we have set up for you on ScriptDoll. These are the demographics that are in there, but for your profile it will be your demographics. Then, for images, we have a ton of great images that we have actually hand-picked for you guys. [00:01:00] When you’re in this view, you’ll have to open the link in a new tab by right-clicking, but when you download it, you can click normally. Once this page loads, you can see we’ve got all these great images that are fantastic for Facebook ads. You can just click through and use that image. They’re all commercially free to use without attribution, so these are great. If none of them work, go ahead and click this FAQ and go visit our blog. [00:01:30] We’ve got a post for you on how to get other free images or get other content for your ads. Back over here in the script, that takes care of the images part, and the copy. We’ve got 10 different sets of copy for you guys. Some of it’s long, and some of it’s short, and some of it’s in between. That’s because we don’t know what your audience will respond to, and neither do you until you test. So, be sure to test. You’ve got all kinds of great copy here. You can mix and match the headlines. Be sure to double-check that your verbs are correct. Go through the script. Actually read it. [00:02:00] Sometimes it might be a little too long depending on the words that you have on your profile for the headline or the caption. Just rework it. Say, you know, “Stop your puppy from chewing everything in sight.” Then, once you’re done with that, you can copy it from here if you want because you can always save it to your scripts. That is up here in the top right or at the bottom, or you can download a copy the same way you’ve always been able to with a Word, HTML document, or a PDF. When you download that, all this stuff downloads with you so that you have it all right in one spot. [00:02:30] You guys, use these. Test your ads because this, if you do it right, will pay for your entire year of ScriptDoll. Really, you guys, there’s no excuse for you not to A/B test. Do it to your budget. We give recommendations on pricing in here because we know some of you guys have a lot of ad budget and some of you guys have very little, so we give you recommendations for both. We tell you our insider secrets that I stole from our ad lab team. You guys, there is a lot of great information in this script, so be sure to use it and let us know how it goes. [00:03:00] Thanks for being a ScriptDoll user.